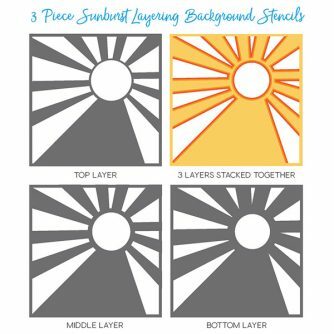 The Sunburst Stencil set by Honey Bee Stamps is a layering set of 3 stencils. Each layer is different sizes of sun rays to add dimension with your ink blending or misting. The stencils are 6×6” and can fit across a standard sized card. Use with inks, mists, pastes or paints. Honey Bee stencils are made in the USA.